Marvel Comics is now hyping an event set for 2012 with the tagline, "Destroy!" featuring a number of their more monstrous characters. I have a preview image, but due to SPOILERS mainly for Incredible Hulks #635, you'll have to click to see it after the jump! As you can see, the image features some well-known characters, like the She-Hulk (Jennifer Walters), the FF's Thing, and the Beast, late of the Secret Avengers (but also an X-Man). 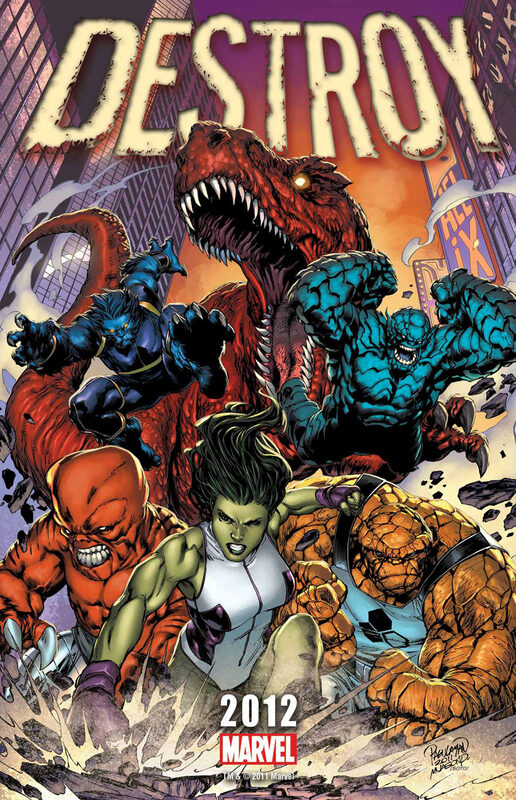 It also features some not-so-well-known characters, like Karkas of the Eternals and Devil Dinosaur, both Jack Kirby creations from the seventies. Most interestingly, it features Rick Jones, the "A-Bomb," which means we can conclude that the perennial superhero sidekick will not lose his powers in the final segment of "Heart of the Monster," on sale next Wednesday. The image, drawn by Carlo Pagulayan and Jason Paz and colored by Chris Sotomayor, teases a project that will be announced this Saturday at FanExpo Canada during the Pint O' CB panel. Marvel encourages fans to "Join the conversation on Twitter with #FVL!" The only "FVL" relevant to Marvel I know is one Fred Van Lente, writer of good stuff like Herc, Alpha Flight and Comic Book Comics and lotsa other fun tales. While it seems like just the kind of nutty line-up ol' Fred would love to write, we'll have to wait and see for more info.